Deal Alert: Get An Unlocked Nextbit Robin For $117.99 - AndroGuider | One Stop For The Techy You! Although Nextbit has stopped the production of the Robin, some units of the phone are still available for purchase. 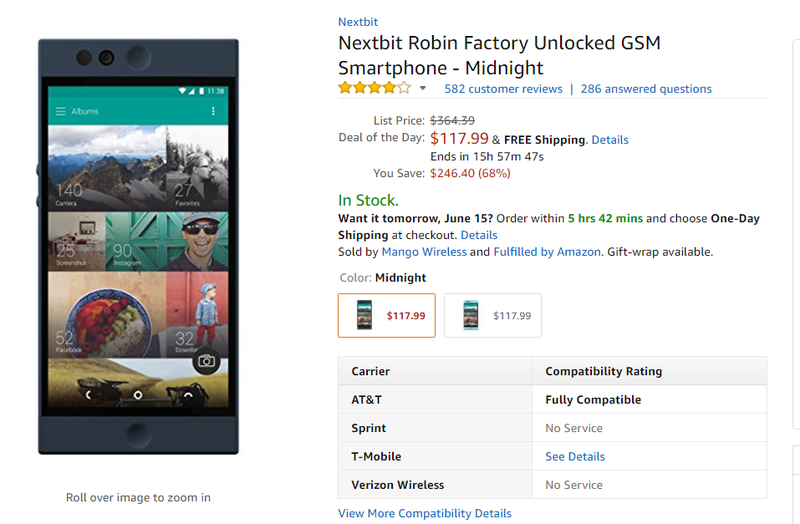 If you are looking for an affordable phone with decent specifications, you should consider buying the Nextbit Robin at $117.99. The phone has received a price cut of $246.40 from it's list price of $364.39. You can grab the phone in both mint as well as the midnight color. The phone is being sold officially by Nextbit. Nextbit was acquired by Razer recently and the company has assured the owners of Robin that they will be receiving software updates till February 2018. It's also worth noting that if you purchase Robin today, Nextbit will honor your warranty only till February 2018. If you are looking at carrier compatibility, the Robin is fully supported by AT&T, partially supported by T-Mobile and not supported by Verizon and Sprint. Nextbit Robin is powered by Snapdragon 808 along with 3GB of RAM. It features a 5.5" IPS full HD display, 13/5MP camera and is fueled by a decent sized 2680mAh battery. An hour of charging should get you through a day since Robin supports QuickCharge 2.0. Robin was recently updated to Nougat 7.1.1 and is expected to get the Android O update. If you are interested in buying the Robin, check out the source linked below.